Accuracy in judging personality is important in clinical assessment, applied settings, and everyday life. Personality judgments are important in assessing job candidates, choosing friends, and determining who we can trust and rely on in our personal lives. Thus, the accuracy of those judgments is important to both individuals and organizations. In examining personality judgment, this book takes a sweeping look at the field's history, assumptions, and current research findings. 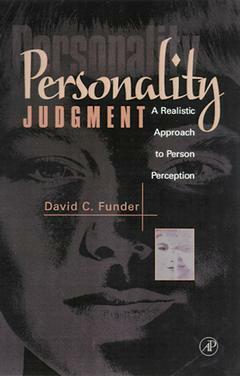 The book explores the construct of traits within the person-situation debate, defends the human judge in the face of the fundamental attribution error, and discusses research on four categories of moderators in judgment: the good judge, the judgeable target, the trait being judged, and the information on which the judgment is based. Spanning two decades of accuracy research, this book makes clear not only how personality judgment has come to its current standing but also where it may move in the future. * * Covers 20 years worth of historical, current and future trends in personality judgment. * * Includes discussions of debatable issues related to accuracy and error. The author is well known for his recently developed theoy of the process by which one person may render an accurate judgment of the personality traits of another. The Very Existence of Personality. Error and Accuracy in the Study of Personality Judgment. The Process of Accurate Personality Judgment. Social psychologists and researchers in personality; graduate and advanced undergraduate courses in personality and person perception. David Funder is best known for his research on personality judgment and his recently developed theory of the process by which one person may render an accurate judgment of the personality traits of another.He has also published research on the longitudinal course of personality development, delay of gratification, and attribution theory.